Sculpture consists of four symbolic elements. One is a large rectangle with a cloud on top incised with details which reference architecture, nature and water; three other forms are a stepped vertical rectangle, a peaked angle, and a low curve form. 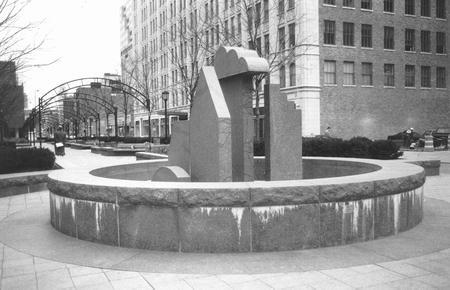 : Stuart Fink, “Kadetz Fountain,” Ohio Outdoor Sculpture Inventory, accessed April 18, 2019, http://oosi.sculpturecenter.org/items/show/485.